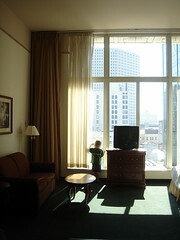 K standing at the window in our hotel room in Milwaukee. I love the high ceilings. 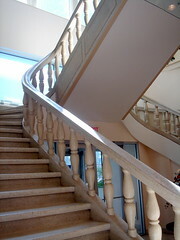 The original, old, staircase in the lobby. 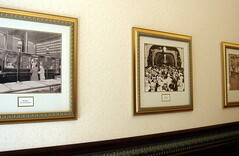 Photos of the hotel in it's previous life ... as a Gimbels department store, and then as a Neimann-Marcus department store (I think). The wall in the elevator. 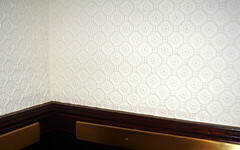 It looks like the textured wallpaper you can buy, but it's super firm and "real". I couldn't help but touch it each time we used the elevator. From the car looking up. 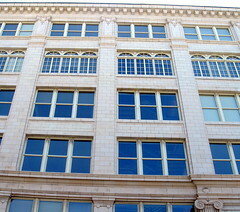 I love the classic architecture and details. It's fun being in a city that actually has stuff that's more than 60 years old (well, we have some homes near us from the '20's but they are few and far between). I, especially, couldn't take his eyes off the buildings and oohed and aahed with me over the uniqueness of everything. Come to find out we arrived on the last weekend of Summerfest ... which, I had no idea, is huge. There wasn't anything playing last night that I'd have taken the kids to (C had a list of acts she wanted to see, but I'd never heard of any of them ... now I know how my parents felt when I was a teenager! ), but INXS is playing tonight, and the night before Jason flew out Violent Femmes were playing. Next year some of that will be fit into our plans!